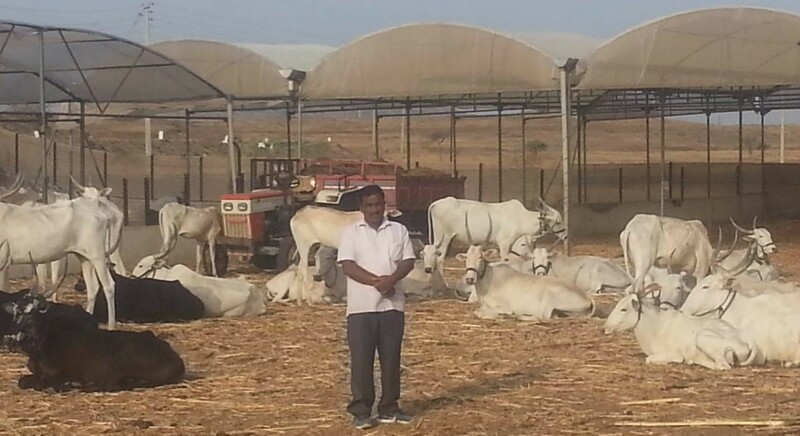 Articles“60 Khillar desi breed cows are the biggest asset of my farm.” – Ashok Ingole, Satara district, Maharashtra. “60 Khillar desi breed cows are the biggest asset of my farm.” – Ashok Ingole, Satara district, Maharashtra. “60 Khillar desi breed cows are the biggest asset of my farm. We take care of cows and in return cows take care of our pomegranate orchard. Every year in August month we harvest minimum 200 ton from 9 acre orchard. If the fruit is sold at the least price of Rs. 70/kg then the income is Rs. 1.40 crore. In this after deducting farming and home expenses of Rs. 40 lakh utmost, we make a net profit of Rs. 60+ lakh annually. Moreover we eat healthy and nutrition rich food so our medical expenses are negligible and peace of mind plus soul is immeasurable. With these monetary returns and invaluable happiness, is there any profession better than farming?” questions humbly Mr. Ashok Ingole. He is doing cow based farming since 2001. He hails from Bidal village, Satara district, Maharashtra. 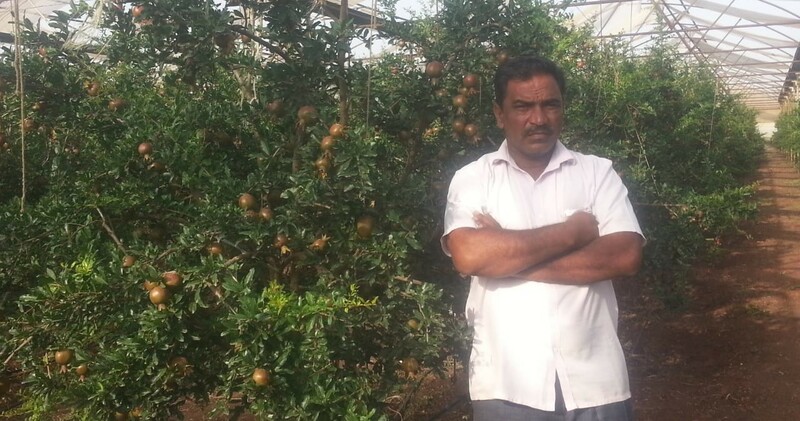 His farm spreads in 25 acre in which there are two orchards of pomegranate, 4.5 acre each, 6 acre is used for growing all the produce for personal consumption and remaining 10 acre for fodder cultivation for the cows. “Our farm operations are smooth and we do not face any threats of soil borne diseases, pest attack or drought issues. Pomegranate trees in our farm have high resistance power and adaptable to the climate changes. Reason being the soil is nourished with Khillar cows’ urine and dung based agri inputs,” he highlights. Soon after completing his graduation in agriculture in 1991, Mr. Ingole became full time farmer. Being an educated farmer, he started with hi-tech farming that demanded more investment and incurred more expenses. In 10 years, his debts mounted and it was difficult to even pay the interest on loan amount to the bank. It was tough to meet the ends! At last Khillar cow came to the rescue, “In the year 2000 I read somewhere that cow based farming is profitable. I decided to give it a try and selected ‘Khillar’ native cattle breed of Maharashtra state. I began rearing the cow only for its dung and urine. Slowly the situation reversed, our farm flourished and generated lucrative revenues,” he describes the drive to quit chemical farming practices. In the farm there are 2 bulls and 60 cows. By nature Khillar cattle is quite aggressive in nature. “Yes! It is quite aggressive but only to the strangers and not to the caretakers,” he clarifies. It is the most active indigenous cow breed of India. “In bull running competition, Khillar bull covers the distance of 1200 meter in mere 14 seconds. It also performs really well in farmland ploughing and other agricultural activities. We use our two bulls in farming.” To avoid in-breeding the bulls are sold/exchanged in 2.5-3 years. The female calves are retained in the farm while male calves are sold after one year at Rs. 30-40 thousand. Milk of Khillar cow is packed with nutrients and has very good taste. “We do not sell the milk. The cows are milked only for personal consumption rest of the milk is for its calves,” he highlights. Cow dung and urine in the farm are collected methodically. The cows roam liberally in the shed constructed in half acre. Some area is left open while remaining is covered. In the open area, the top surface is covered with dry sugarcane and farm waste. Cow moves freely and drops the dung on it. Slowly the dung naturally decomposes in the farm waste. “We replace this filling once in a year and use it as manure in the farming. This manure is complete food for the pomegranate plants and rest of the cultivation. It contains all the required nutrients,” he asserts. Cow urine flows down in the underground tank. “The covered area in the cow shed has the concrete flooring and is architecturally designed low so that the urine flow is directed towards the underground tank. We make the slurry in the same tank. Once the slurry is ready we lift it in the tanker (8000 litre capacity) and carry the tanker in the farm as required. In every farm we have a bio-digester in which the slurry is poured. Through the bio-digester the slurry is filtered and fed in the soil through drip systems,” elucidates Mr. Ingole. Entire Khillar herd at the farm is fed with farm grown organic fodder. Every day each cow needs 15 kg green fodder, 3 kg dry fodder and 1 kg concentrate. Green fodder comprises of seasonal greens namely maize, lucerne and marvel. Dry fodder is dry grass of sorghum. Concentrate is mix of groundnut cake, maize, mineral mixture and salt. Bhagwa variety pomegranate is grown in the orchards. Manure is applied in the orchard in February during flowering period. “It is important to give good quantity of nutritional compost to each plant in this month then only yield will be good. Imbalance in the nutrient requirement of soil leads to flower drops therefore sufficient quantity of compost must be given to the plants. 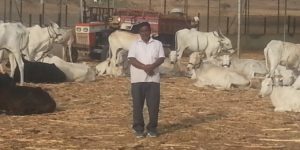 The water required for irrigation is one-fourth of what is needed in the neighboring farms because in our farm the soil has good water retention capacity as it is fed with natural compost prepared from Khillar cows’ dung and urine,” he explains. Mr. Ingole also sells pomegranate saplings. Every year 50 thousand pomegranate saplings are prepared through grafting method in the month of May. Usually saplings attain height of 1-1.25 feet in 2-2.5 months and then sold to other farmers. It starts fruiting in 18 months and later the plant yields once in year for 10 years. The saplings are sold at Rs. 20/piece. The demand of the saplings exceeds the supply thus all our saplings are sold through advance booking. In future, along with the present operations Mr. Ingole plans to develop Khillar breed as milking breed. “On an average Khillar cow yields only 2-3 litre milk per day but we have one special cow that yields 10-12 liter milk/day. It is a unique cow, found one in thousands. Through this special cow we are trying to develop Khillar breed for its milk. It has given birth to a male calf and now we are developing it for breeding so that entire breed’s milking ability can be improved and farmers shall be inclined to rear Khillar cow. If the cow enables farmer to earn Rs. 3 lakh annually then he will be interested in taking care of the cows and once again our indigenous cows of India will return to the farms and agriculture will prosper,” he reveals. “Farming is unbeatable by any other profession! In this one seed multiplies 10 times in just four months which again multiplies further. It is upto farmer’s capacity to encash this growth potential with only requisite to pursue farming using the livestock asset. Unfortunately with misleading advertisements farmers are diverted towards chemical inputs and hybrid seeds that indirectly force him to move away from his livestock asset. As a result balance of livestock and human populations has been disturbed! Earlier when our country’s population was 40 crore, we had 1.5 crore cows and bulls but now the human population has increased to 125 crore while the cattle population is limited to 3 crore. This imbalance is causing all the problems. Correct this imbalance and life will be set once again with farming affluence,” concludes Mr. Ingole. At Post Bidal Village, Man Taluk, Satara distict, Maharashtra. Previous PostPrevious Yunus K Khan – agri consultant from Akola, Maharashtra.